According to the U.S. Geological Survey (USGS), the number of earthquakes east of the Rocky Mountains has increased dramatically since 2009. 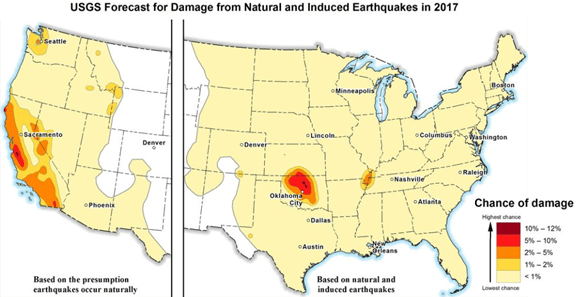 More earthquakes in these areas have coincided with the increase in oil and natural gas production from shale formations. Seismic events caused by human activity—also known as induced seismicity—are most often caused by the underground injection of wastewater produced during the oil and natural gas extraction process. Most induced earthquakes are small, measuring in the three- to four- magnitude range on the moment magnitude scale. These earthquakes are large enough to be felt by most people, but they do not often cause damage to structures. In Oklahoma, where production is in areas with high water-to-hydrocarbon ratios (meaning there is more produced wastewater that must be disposed), the number of earthquakes has increased significantly since 2009. In addition to the increased use of wastewater injection related to oil and natural gas production in the region, the geologic conditions in central Oklahoma are conducive to triggering seismic activity. The rock underlying the formations where disposal water is being injected in the region has existing faults that are susceptible to the changing stresses caused by fluid injection. Without these geologic conditions, induced seismicity would be much less common. For example, induced seismicity in the Bakken region of North Dakota and Montana is relatively rare.